Let's play a game: Two truth and a lie. Two of these statements are true and one of them is false. Can you guess which one is the lie? The most popular mail client of all TINYpulse users is Microsoft Outlook. You have to send a Cheer by logging in to TINYpulse each and every time. Recognizing your teammates actually doesn't have to be tedious and difficult. Did you make your guess? If you chose #2 as the lie, then you'd be right! 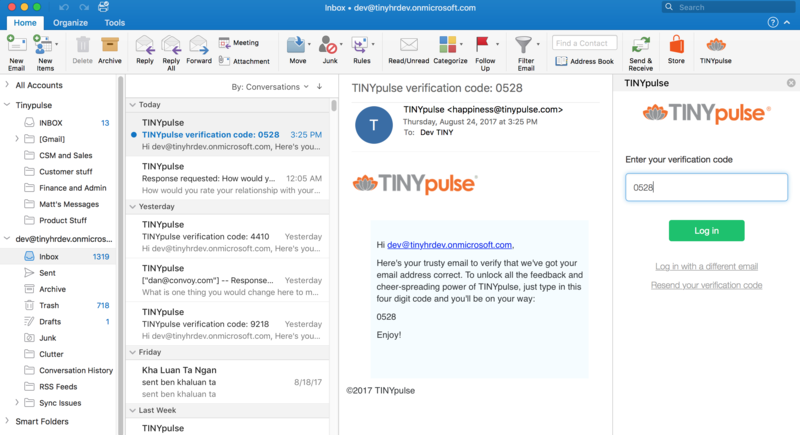 TINYpulse has partnered with Microsoft to bring you a TINYpulse add-in for Outlook. If you're a user of Microsoft Outlook, you'll never have to leave the mail client again to send a Cheer. 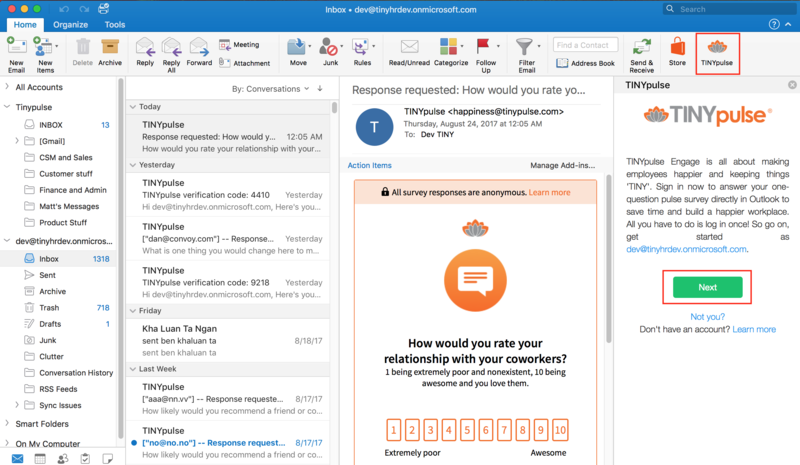 Once you install the add-in, your TINYpulse survey email will open within Outlook where you can quickly and easily send Cheers to recognize teammates and colleagues for their good work. Belong to an organization with an active TINYpulse subscription and have your own account. Have an active email account with Office365 or Microsoft Exchange. Use Outlook 2013 or later on a PC, Outlook 2016 for Mac, or Outlook for the web. Are you an employee at an organization that subscribes to TINYpulse? Do you use Outlook? If so, you're in luck! You can now install an Outlook add-in that let's you respond to your latest TINYpulse survey and send Cheers more strategically. Have you ever been responding to emails or have just gotten out of a productive meeting and wanted to say 'thank you' or 'good work' to the recipients? Well, now you can without every having to leave Outlook! Send Cheers directly from an email or meeting invite, and even anonymously respond to your TINYpulse survey with this awesome tool. Installing the add-in from the Microsoft app store only takes a moment and you only have to sign in once. From Outlook, click the Store icon in the top tool bar. Go to https://store.office.com/ and search for TINYpulse. Once in the Microsoft store, click the green Add button. Sign into Office 365 using your work email address and password and click Sign In. You'll now be back at the Microsoft store with a confirmation message if the install was successful. Return back to Outlook and click the new TINYpulse lotus icon in the top toolbar on the right. Log in to TINYpulse by following the instructions at the end of this article. If someone from the technical support team for Outlook at your company can configure the TINYpulse add-in from their end, employees won't have to do anything but login. This is definitely the better option since it will automatically appear for employees on their PC without having to do the configuration themselves. Note that this process needs to be completed by an Outlook administrator and can't be done by individuals outside of that admin team. If you're an individual who wants to install the TINYpulse add-in for Outlook, please move to the second section down below. 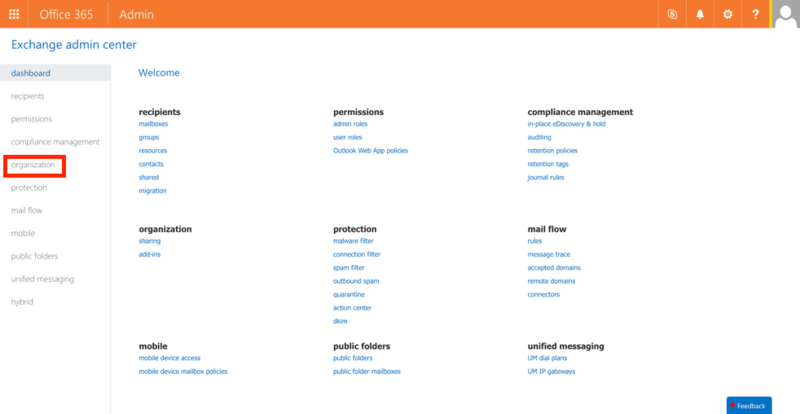 From the Exchange admin center for Office365, select Organization in the menu on the left panel. Click the + icon and choose Install from custom URL. Paste this URL into the text box https://app.tinypulse.com/tinypulse-outlook/manifest-tinypulse.xml and click Install. Wait a moment for the install to complete. Find the TINYpulse add-in from the list and click the pencil icon (edit button). Select Optional as the default option and Save. You're done! Super easy and now the TINYpulse add-in for Outlook has been pushed down to all machines at your org and is also available to your employees via the web. Now that you've installed the add-in, you still have to log in in order to respond to your TINYpulse survey in Outlook. we promise it takes less than a minute! Either from the web or desktop version of Outlook, click the TINYpulse lotus icon in your toolbar, then Next to get started. Enter your TINYpulse password and click Log in. If you don't have a password, you'll be sent an email with a verification code. Enter that code to finish logging in. And if you'll believe it, you're done! Easy right? Complete your current TINYpulse Engage survey, view the results graph, send Cheer, and more all from the convenience of Outlook. Learn how to get the most out of the TINYpulse Outlook Add In.